By Vanessa Noble. Scottsville: University of KwaZulu-Natal Press, 2013. ISBN 978-1-86914-252-0. Vanessa Noble has pulled a rabbit out of a hat by weaving what is essentially a scholarly monograph into an extraordinarily vibrant narrative on the history of black medical training in South Africa, specifically at the University of Natal Medical School, now the Nelson Mandela School of Medicine of the University of KwaZulu-Natal. The book is exceptionally well researched from primary sources, with numerous references and footnotes, and yet written in a style that makes it a page-turner. 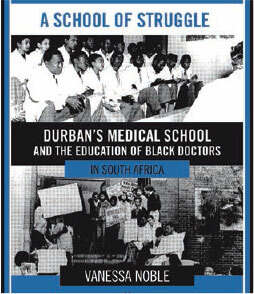 It chronicles the convoluted evolution of medical training for black South Africans that culminated in the establishment of the Durban Medical School (DMS). It recounts how this process was shaped by the then prevailing white social attitudes, and buffeted by a succession of socio-political and historical quirks, including the Christian missionaries, the emergence of black political consciousness, World War II, the ambiguously 'liberal' yet segregationist politics of the Smuts era, the gradual formalisation of the healthcare system for black people, and the race-based rigidities of the apartheid era following the electoral victory of the National Party in 1948. The author traces this history from the formation of the Union of South Africa in 1910, at which time the racially segregated health services for black South Africans were reported to be 'disorganised, underfunded and in a state of general neglect' and, as described in an SAMJ editorial in the 1940s, 'all patchwork, a patch here and a patch there and no planning'. Services that did exist were focused on curative interventions with no provision for preventive public health approaches to combat the infectious diseases that were rampant in many black rural and urban areas. Moreover, the system lacked black medical practitioners. Black students were barred from studying at the country's recently established medical schools at the universities of Cape Town and the Witwatersrand for fear that 'social and academic fraternisation might lead to racial mixing' and because, in any event, blacks 'lacked the mental capacity to master a difficult subject like medicine'. The fiercest antagonists were the white medical profession, who dreaded the competition black doctors would pose. In later years, both UCT and Wits were to admit a token number of black students until they were interdicted by apartheid legislation in the 1950s. Until World War II, aspirant black students who could afford it or were sponsored by missionaries went abroad (most often to Scotland, Ireland and the USA) to study. They returned to establish successful medical practices, sometimes with black and white patients, and became significant social and political leaders. The notion of a medical school dedicated to training black doctors was the brainchild of Dr James B McCord of the American Board of Foreign Missions. Founder in 1909 and first superintendent of Durban's McCord Zulu Hospital, his passion led him to establish such a private medical school at the hospital in the early 1920s. It ended in failure, shot down by the Medical and Dental Council. He continued his advocacy for a black medical school until his retirement in 1940, when his colleague and successor, Dr Alan B Taylor, picked up the cudgel in the single-minded pursuit of McCord's vision that eventually resulted in the establishment of Natal University's DMS with Dr Taylor as the founding dean. Noble's account of the years of twists and turns in this pursuit makes for compelling reading. This book represents a fitting and important archive to restore and preserve Dr Taylor's legacy, which, sadly, time has conspired to erase from the university's institutional memory. The chapter on the Alan Taylor Resi-dence, 'a setting full of contradiction and ambiguities, will no doubt conjure up bitter-sweet memories, as it did for me, for those who had the experience of living and studying there. Known to its residents as 'Alan Taylor', 'Wentworth' or simply 'the Res', it consisted of single-storey, asbestos-roofed rows of abandoned 'Second World War-era barracks in the ['coloured'] suburb of Wentworth' adjacent to a gigantic and stinky oil refinery. Yet the Res was, in essence, the heart of the DMS. It was home to medical students throughout the six or seven years of study, and provided teaching facilities for the preclinical years. Here students were offered the rare opportunity to enter the prestigious medical profession, but in a degrading environment contrived to be as far removed from the white university campus as possible. They were forbidden to wear the university blazer, or to graduate at the same ceremony as white students. This 'liberal' university seemed oblivious to the irony of publicly professing opposition to the segregationist government policies while enforcing strict racial separation within its own walls. Yet life at the Res was not all doom and gloom. I have some fond memories of the camaraderie, the student clubs, the ballroom dances, the laughter, and the intellectual debates. The Res became the epicentre of political radicalisation and mobilisation against apartheid epitomised in the story of Steve Biko and the Black Consciousness Movement. Chapters 6 and 7 provide a detailed overview of the students' anti-apartheid struggle and political activism from the 1950s through to the 1980s, the police raids and the student arrests, with some student activists (myself among them) escaping to complete their studies abroad. The book also describes the appalling conditions at the King Edward VIII teaching hospital - the dilapidation, the chaos, the racism of some academic staff - but also the boundless learning opportunities. Notwithstanding all the challenges, tensions and contradictions, the DMS project was in many ways a huge success, as measured not only by the quality and number of doctors it produced, many of whom went on to distinguish themselves in research and clinical practice, but also by its contribution to the 'struggle' and its role as an incubator for many of today's leaders. This book tells a remarkable and compelling story, and constitutes a unique and invaluable archive of an important history that should interest practitioners, academics and social scientists alike. This is an excellent book. It took about 10 years for the author to collect and collate the material, in the course of which she interviewed many of the graduates of the medical school and those who provided years of service to it, and the book is interesting, factual and unbiased. It begins with the historical background of black medical education in South Africa between 1910 and 1945, followed by the establishment of the Medical School at the University of Natal. This difficult journey, the Alan Taylor Residence and the challenges of studying medicine in Durban are detailed. Clinical training at King Edward VIII Hospital in the 1950s and 1960s, the anti-apartheid struggle in the 1970s and 1980s, medical student political activism and its consequences, and the legacies of medical struggles in postapartheid South Africa are documented. Finally, there are the author's reflections. The appalling conditions in which medical students worked and lived made many embittered, with some becoming politicians. In the early days of the DMS, professional opportunities for black students were restricted to medicine, law or teaching. Many who studied medicine came from the 'cream' of their society. It was inevitable that harsh and unjust discrimination would drive some to politics. They joined the African National Congress, held or are still holding key posts in the government, and are mentioned in the book. The teaching staff were mainly 'liberal' in outlook and dedicated to their task. The classes were small, engendering a close rapport between teachers and students. Research elevated the status of the medical school nationally and internationally. The high standard of graduates enabled many to pursue an academic career and hold senior positions locally, nationally and internationally. Sadly, the harshness of apartheid took its toll on the morale of black staff and students. Nearly all experienced discrimination. In my own case, in the 1960s, I received 65% of the salary of the white registrars I trained (and was told disingenuously that my standard of living was lower than that of whites). In 1962, having obtained my fellowship of the College of Medicine, I was promoted to consultant but was paid the salary of a medical officer, as there was no category of black consultants. In 1970, having trained in renal medicine under Sir Douglas Black in the Royal Infirmary, Manchester, UK, I was forbidden to work in the renal unit at Addington Hospital in Durban because I could not give instructions to white nurses. The renal unit was for white patients only, and was staffed by white doctors. However, in 1977 the Director of Hospital Services approached me to head the unit as, following emigration of all the white nephrologists, it could not function. I asked for three conditions to be fulfilled, viz. that the unit would treat patients irrespective of race, that doctors and nurses could work there irrespective of race, and that white patients would be treated by all doctors and nurses. After conferring with politicians this was agreed. An unhappy situation occurred when a white patient refused to be treated by a black doctor and was discharged from the hospital. I enjoyed reading this book and would recommend it to all doctors who graduated from the University of Natal and KwaZulu-Natal and their families. It would also be of great interest to other doctors wishing to learn about the harshness of apartheid. It is the first book written on the subject, and makes an important historical contribution. It is appropriate that the first president of democratic South Africa, Mr Nelson Mandela, agreed to the medical school's bearing his name. Challenges continue, however, and a 'school of struggle' it remains.